Mesa Verde is a testimony to the lost Anasazi civilization, consisting of rock-cut villages on a high plateau in Southwestern Colorado. The area has seen regular human occupation since the 6th century. 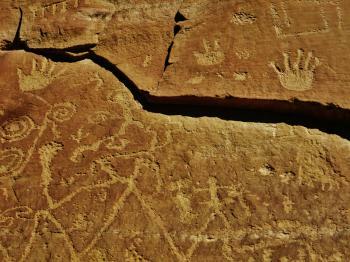 The Anasazi (or Ancestral Pueblans) constructed villages with several functions: agricultural, handicrafts, religious. The villages were adapted to the rigors of the natural environment, and its semi-arid climate. Multi-storey constructions were erected under the shelter of the cliffs. The culture reached its epogee between the 11th and 13th century, before suddenly disappearing. The site was rediscovered in 1874. Driving on the entrance road to Mesa Verde National Park I enjoyed the autumn colours, but I also couldn’t look away from the many dead trees. 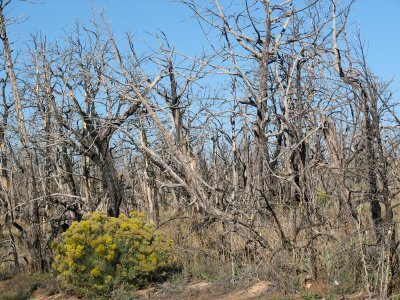 They have been affected by massive fires over the last years, and also are under attack by beetles. I had booked a two night stay in the park’s Far View Lodge to have enough time in the park, and that proved to be a good choice. As my room wasn’t ready yet, I started sightseeing immediately. Closest to the entrance are the Chapin Museum and Spruce Tree House. I watched the video at the museum about the origins of Mesa Verde, and the questions that still surround it (why did the people chose to move to cliff dwellings?). Spruce Tree House is one of the best preserved dwellings. It’s just a 15 minute walk down from the museum. Although it’s late in the afternoon there are still about 50 other visitors. All rooms are covered by the huge overhanging rock. About 100 people lived here at the time (13th century). It’s cramped, but you notice that the place keeps really cool while the sun is burning on the lands around and above it. The next morning I make it an early start. First stop is the House with the Many Windows. This is situated on the other side of the canyon and looks like an apartment building (with its many windows – that are actually doors). A bit further on, I meet a group of deer that aren’t scared of cars at all and take their time to cross the street. Squirrels and turkeys are also common sights in the park. At the Far View Sites two buses full of schoolchildren were unloaded just as I arrived, but fortunately I could avoid them a little (they were kept quiet also by a loud talking but enthousiasmising park ranger). These Far View Sites date from about the same period as the rock dwellings, but are built on the earth. That way they look a lot like those at Chaco Canyon, where I was earlier this trip, and like modern day Pueblo's like Taos. The inhabitants of the Far View Sites also probably have constructed an artificial water reservoir (Mummy Lake), which you can visit too (it’s now dry). For the rest of the day I buy tickets for the guided tours to Cliff Palace and Balcony House. These two large complexes cannot be visited on your own. The Cliff Palace tour is led by a park ranger, who warns us beforehand (just like they did at the ticket office) how strenuous the walk will be. The distance in total however is less than a kilometer. Already from the top there’s a great view on Cliff Palace. 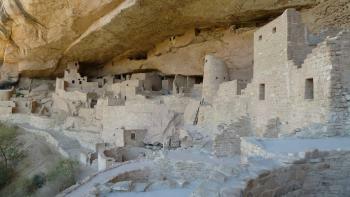 This is the largest building in Mesa Verde, consisting of 171 rooms and with both square and circular towers. It’s like a small village. People could only survive here because there’s access to water. They grew their crops on top of the mesa. The tour lets you get up and close with the building, and includes long (but interesting) explanatory talks by the ranger. The Balcony Tour later that day attracted a lot less participants than the one earlier: probably many were deterred by the 32 feet (10 meter) high ladder you have to climb, or don’t fit through the small tunnel you have to pass crawling. All this extra fuss just makes it more fun to go of course. Balcony House can’t be seen from the trail above. You first have to walk down a path until you are below the rocks. There you find the ladder, a sturdy one fortunately. Balcony House is built like a fortress, unlike the other houses in this area. Besides the climbs there were also small tunnels to make wannabe attackers vulnerable when their heads would pop out. On the tour we only have to crawl through one on our hands and knees. You do get a lot of respect for the designers of the house: from nothing else than a hollow rock they’ve made a liveable plateau with multi-storey houses and kiva's, underground ceremonial chambers. While hiking the Inca Trail last month, I was wondering how different North American cultural heritage might look if the Inca Empire had extended further north. We may never know what North American Incan architecture would look like, but North America does have incredible Puebloan architecture from the 12th century on display at Mesa Verde National Park in southwestern Colorado. Mesa Verde was one of the first two US World Heritage Sites, and part of the first group of World Heritage Sites inscribed in 1978. The exquisite Cliff Palace is rightly famed, and looks incredible from the viewing platforms; unfortunately when I visited in May 2016, palace tours had not yet started for the season. Instead, I signed up for a tour of Balcony House, built high up on the side of a cliff. I thoroughly enjoyed the tour, and was impressed at the craftmanship of the rooms and kivas, which look out over a valley. After the tour, I drove around the park's loop trails and stopped by the museum at the visitor center before continuing to nearby Wetherill Mesa, where I visited Step House and hiked some of the Long House trail. Mesa Verde deserves at least one full day for a visit, if not more, and is one of the best cultural sites the US has to offer. 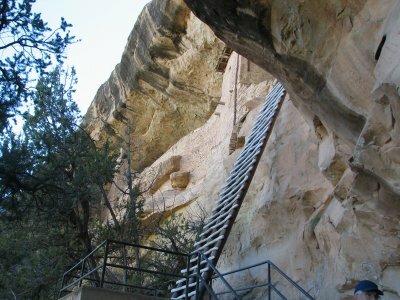 Logistics: Mesa Verde is expansive and requires private transportation for access; there are several hiking trails available once in the park. Before I visited Mesa Verde National Park, I really had no idea what the place will be looked like except the famous image of Cliff Palace, as a result, I really surprised when I drove pass the entrance of national park to reach my hotel in Cortez and saw the whole stunning mountain and winding road to reach the top of the mesa, really beautiful but I really concerned that my small compact rental car would be capable to take me there or not after many slow climb on Colorado mountain road. In the next morning around 8.30 AM when I approached the visitor center to buy ticket to see Cliff Palace and Balcony House, the 11.00 AM ticket of Cliff Palace tour was already sold out, so I got my slot at 12.30 PM instead. The visitor center itself was quite impressive and the statue in front of the center was really nice to see. I drove slowly to the top of mesa. The road turned out to be quite easy to drive and the view was really great. Unfortunately I was unable to be on time for the Balcony House tour, so I decided to take the Mesa Top Loop road instead. This scenic route has nice view of the Navajo Canyon and some ancient pit houses which are fine. The best part of the loop is the Sun Temple since apart from the ruins, the Cliff Palace can be seen from this spot and the view is really photogenic. Then I went to the Spruce Tree House, this place can be explored without tour. The pathway down to the ruin is quite steep, but the ruins are really must see especially if you cannot secure ticket to the Cliff Palace. I skipped my lunch in order to be at Cliff Palace on time. The view of Cliff Palace from the waiting area is truly stunning and actually the best place to take photo, so even you don’t have tour ticket, you still can admire the place. I saw many tourists disappointed to learn that they have to buy ticket at visitor center not at the site. The tour was really nice, the palace is very interesting, mysterious, really one of the best archeological site of USA and not surprising to be one of the first World Heritage Site of this country. The tour ends with ladder climb which was very easy even for senior people or with the baby. 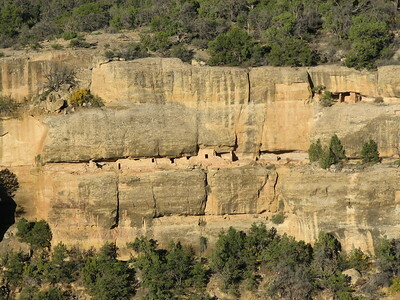 One of most interesting information from the Cliff Palace tour is that at present many archaeologists and historians start to believe that the people who built Mesa Verde may not be Ancestral Pueblo, as commonly understand. The park is planning to change all information to update the new study. 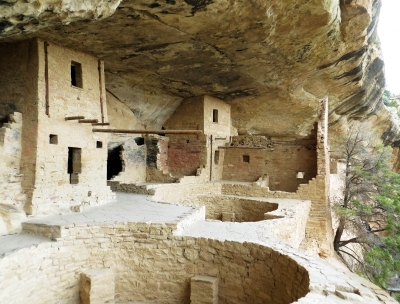 Nevertheless the people of Mesa Verde were one of the most developed civilizations in this area with evidence of sophisticating irrigation system for farming. Another fact and really shocking is that the whole Cliff Palace is slowly sliding to the below canyon and the engineer are trying to stop this problem in order to preserve this impressive heritage. 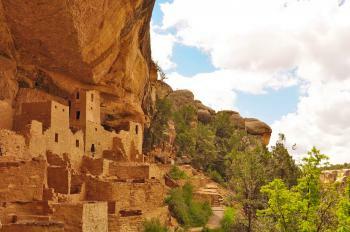 In my opinion Mesa Verde is the must see of USA and the best place to see impressive culture of Native American. Actually the whole Mesa Verde is impressive and can be a mixed World Heritage Site for its cultural and natural wonders. The Southwest is filled with living and extinct Native American cultures, and Mesa Verde is an absolute must when visiting the region. 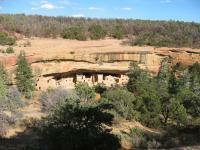 I visited Mesa Verde National Park twice, once in 2009 and a second time in 2014. The national park is large enough that during my second visit much of what I explored was new. Like much of the Ancient Puebloan cultures in the Southwest, their story is one we are still trying to better understand today. They built massive structures, practiced astronomy, traded with coastal peoples, and established trade routes extending to Meso-American cultures. 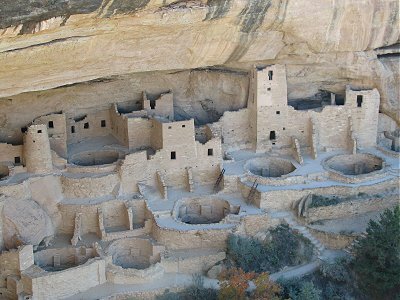 To me, Mesa Verde and specifically "Cliff Palace" is America's Parthenon, a grand structure designed by master architects that should be more well-known. Mesa Verde, Chaco Culture, Taos Pueblo, and Canyon de Chelly in Arizona are the most exceptional and representative examples of Southwestern Native American cultures both very much alive and long extinct. There are some sites that I want to visit from the first time I see a picture of them. The Cliff Palace at Mesa Verde has been one of them for several years, and it certainly didn't disappoint. The tour of the Cliff Palace was really well conducted. Our guide was very informative and friendly evidently reflecting a love of his job. The first view of the "Palace" from the lookout was impressive, but getting down in amongst the ruins was the real highlight. The precarious location has meant that this magnificent feat of engineering has remained in very good condition, with only a few minor modern enhancements. It is incredible to think how these structures were built in this location. Our guide provided answers and various points of view relating to how and why they were created, personally I like this "post-modern" approach to presenting conflicting ideas and answers rather than relying on a basic catch-all narrative. The tour wasn't too physically challenging either. After the tour we drove off on the Mesa Top loop, this afforded great views of the canyon containing the Cliff Palace, as well as nearly a dozen other clusters of houses tucked under the rim. Another good thing about this drive was that there were remains from earlier structures, showing how settlements progressed from the basic round houses on the Mesa top, through to pueblo like structures and then eventually over the edge to the cliff dwellings. On the way out we had a walk around Spruce Tree house, which was especially notable for having a fully reconstructed Kiva that you could descend into. We stayed the night before at the slightly underwhelming town of Cortez. However if you are looking for a town in the area to stop, especially if you are coming from the east, then I can thoroughly recommend Durango. It has a quintessentially American main street which is home to several fine micro-breweries and restaurants. I had been looking forward to visiting Mesa Verde for years and I must admit it didn't disappoint my high expectations. We visited Mesa Verde in 1995 and it was wonderful. We took both the Palace House and the Balcony House Tours and walked through many other sites. We put up a tent and stayed one night. I took several slides and in 2000, gave a show to my grandson's 3rd grade class. Now, in 2008, I will show the slides again to my twin granddaughter's 3rd grade class. They are so excited as they, also, are studying Mesa Verde. The ruins haven't changed, but I suppose the campsite we were in has lost the trees in the fires since we were there. It was Site #54 in the Zuni Loop, a short walk-down site and one of the few with trees. We were very lucky to get it. We were tickled to find, when we returned to camp, that we had a snoozing deer hiding under the foilage a few yards away from the tent. She was not disturbed, and I zoomed in for a picture. I ask the children to see if they can spot her because she is very camouflaged. We've decided we need to come again soon! Mesa Verde is a very difficult site to reach by public transport. The nearest railway station is at Gallup NM (Greyhound stop there too). We rented a car from there to go via Shiprock and Cortez to the Park. After our visit we returned to Gallup by way of the Four Corners monument and the Window Rock. Mesa Verde was the highlight of my trip to the Southwest. I had decided I wanted to see it after reading about it in a book about wonders of the world. Although I was looking forward to touring the cliff dwellings, I had no idea just how much there was to see at this wonderful site. We drove into the park first thing in the morning and spent one very long, perfect September day there, but we could have spent more time easily. Entering the park involves a 25-minute drive up into the hills, which is lovely in its own right because of the views. There are many interesting ruins all along the tops of these hills, but the truly spectacular ones are the famous cliff dwellings built into the walls of the canyons. There is a surprisingly large number of these structures; in fact, there is one viewing point where as you scan the length of a canyon you can see at least half a dozen dwellings all along. The more you look, the more pop out. The tours are excellent, and are indeed a bargain. I'm admittedly an acrophobe, so I was a little nervous about the ladder-climbing necessary, but my desire to see everything was stronger than my fear of heights. Because we arrived in September when the crowds had thinned out considerably, we were able to purchase tickets to tour both Cliff Palace and Balcony House, which one is not able to do in the height of tourist season due to demand. Unfortunately, on the other hand, the Wetherill Mesa Road was closed for the season, so we missed out on a considerable portion of the park, including two more cliff dwelling tours. My husband and I had a terrible time trying to find the UNESCO plaque; even the ranger we asked wasn't sure where it was! So, we asked someone at the visitors' centre where we purchased our tour tickets. We told her of our interest in WHS and she said that it was really lovely, and that we were the first people who ever asked her about the plaque. It turns out it was just outside the entrance to the Chapin Mesa Archeological Museum (we must have walked past it a couple of times, but I guess we weren't paying attention). Mesa Verde is a World Heritage Site that is definitely worth a couple of days' visit; I was looking forward to this stop on our trip the whole time, and was not disappointed. Mesa Verde offers grand vistas of Southwestern Colorado's sweeping mesa plateaus, along with the spectacular ancient cliff dwellings for which it is most famous. From the modern Far View Lodge (and the usual visitor center, restaurant, and gift shop), you can see far beyond jagged and giganitic Ship Rock, almost 50 miles south. The motor hotel's restaurant is reputed to be among the finest in the state, featuring dishes with a Spanish flair, although my wife and I did not visit. We took a half day bus tour by the Aramark Company, with an excellent guide, but I think it was greatly overpriced, and we had experiences of equal or better quality on the one or two hour, $2 U.S. park ranger-led excursions. The ancient sites are amazing! One in particular stays with me: Long House. It includes a large level dance floor centered in the sunshine, in front the immense alcove of curving, overhanging rock, which shelters the actual house. It's several hundred feet long and built on many levels. The brick work has been beautifully restored. The trail is not strenuous, but our ranger reminded us this is a remote place, and treatment for a heart attack would be many hours away at best. In fact, as we began the trek, he said, "If you suffer a heart attack down there, you're dead." The trail is not too steep, though, and is asphalt all the way. The ranger also told us he and another man camped at Long House one night, but left quickly several hours before sunrise, because he heard what he thought was a woman either screaming or singing on the cliff top above. You get the feeling you are violating sacred ground at Mesa Verde, and indeed, you are! Native Americans did not venture into the area for 700 years after the last ancient people suddenly left. They left after working so hard to build these mystical cities over a period of 100 years. The mystery is what keeps people coming, along with spectacular wind swept desert canyons filled with large and small ancient dwellings. Many of them are high on seemingly inaccessible ledges. The ancients were truly master climbers as well as brick artisans. We came away from Mesa Verde with renewed, refreshed spirits. I know many Americans, on hurried vacations with limited time, spend only a day here. We spent three, and came away without seeing everything! Taking the time to sit and enjoy the huge vistas, take leisurely walks on the trails, and read about the ancient culture, can be truly fulfilling. Note: cliff dwelling tours are not for those with trouble walking, or for small children who tend to wander near potentially deadly drops, but if you are of average physical ability, you will come away from this park with a new perspective, and new respect for people of many centuries ago. I suspect that's what the World Heritage Sites are all about, after all, isn't it?! I rate Mesa Verde a 10 on a 10 scale. From "Mesa Verde" to "Mesa Verde National Park"